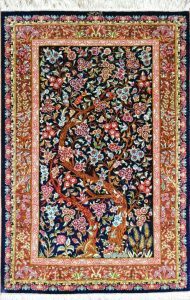 Oriental Rug Salon is proud to lend our experience and certification to those seeking to obtain a valuation of their cherished Persian, Oriental wool or silk rug. Oriental, wool, and silk rugs are a commodity, and their value is based on quality, availability, supply and demand, knot density, age and the condition of the rug. The value of rugs can go up or down in price, depending on market conditions. By generally accepted definitions, an Oriental rug is defined as one that is hand-knotted or hand-woven. This also means a Navajo rug is in the same class as an Oriental in terms of evaluating, and subject to the same criteria as any other hand-knotted or woven area rug. 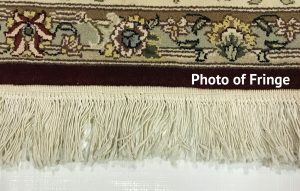 Why Get a Rug Valuation? Two of the most influential factors that go into determining an Oriental, Persian or Turkish rug’s value are its antiquity and where it was made. However, a rug’s quality of workmanship, size and the materials utilized in its creation also play a significant role. Whether you’ve received your Oriental rug as part of an inheritance, purchased it from a dealer or private individual, or obtained it through other ways, knowing what your rug is worth means more than just knowing its value in terms of a dollar figure. While the actual cost of replacement or value on the market is important, it’s equally important to know the history of your rug, its approximate age, and any other information an expert can provide. Most often, rug appraisals are done as a requirement by insurance companies to protect an investment adequately. At Oriental Rug Salon, we take special care in offering you the full replacement value of your rug in the event it becomes irreparably damaged by fire, flood or any other means, which ensures you receive the full compensation from your insurance company. If you are considering the sale of your Oriental, Persian or Turkish rug, then you need to know its value in the current marketplace. 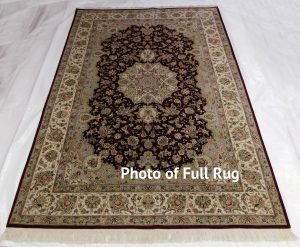 Appraisals are also necessary prior to an auction, so should you be preparing your rug for sale in this way, make sure you have a reputable, expert appraisal performed beforehand to notify potential investors of its value, as well as the other important elements necessary to fetch the greatest price. Though less common, I have many times over the years performed an appraisal for clients who want to offer their rug to a museum, charity or other non-profit entity for exhibition. If you are interested in making a charitable contribution of your antique rug to an organization and want to include this donation on your taxes, you’ll want a valuation to include as proof of the value of your donation. Oftentimes we are asked by interior designers and private individuals alike to assist them in determining a fair market value of a rug they are considering purchasing. We can provide this information so that you don’t overpay for an Oriental rug. You can also use our valuation to force the seller to lower their price to a fair value. We’ve seen clients save thousands of dollars by using our services to assist them in the purchase of a rug. To begin an evaluation, please visit the request valuation page. Facing one end of the area rug, take a picture of the fringe leading into the rug. If the area rug does not have fringe, take a picture as if the area rug does have fringe. 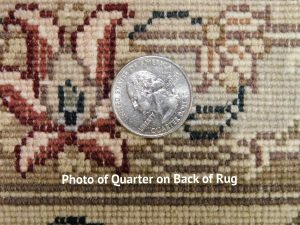 On the back side of the area rug, place a quarter on any area that has knots and take a close up picture. If your area rug does not have knots, simply take a picture of a small portion of the back of the rug. 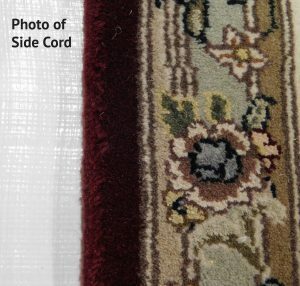 Take a close up picture of the left or right hand side of the area rug (side cord). Once the photographs are received, the usual turn-around time for an evaluation is four business days. We will e-mail you the valuation and send a copy via the U.S. Postal Service that is signed and on parchment paper with a seal of authenticity. The valuations are granted based on the photographic images received, and the valuation is a statement of opinion based on our expert’s experience. The charge for an evaluation is $115.00, and once we receive your photographs along with your name, address, e-mail address and telephone number, we will e-mail you an invoice that can be paid online using any major credit card. Pet Urine and Wool Area Rugs – We Can Clean That! © 2019 Oriental Rug Salon, LLC. All rights reserved.